At precisely 10.10 pm on Monday night, after another baffling day in the House of Commons, all three of Leicester’s Labour MP’s willfully demonstrated their inability to represent the needs of their constituents. They did so in unison by choosing not to vote against the Tories hated attacks on the poorest most vulnerable residents of Leicester: instead of voting against the Welfare Bill they simply abstained. Not all was lost however, and 48 Labour MP’s (including Jeremy Corbyn) were suitably enraged with the Welfare Bill to defy their Party’s leadership. In doing so they voted against the Bill, which on top of slashing tax credits, envisages taking up to £30 a week from sick and disabled jobseekers. 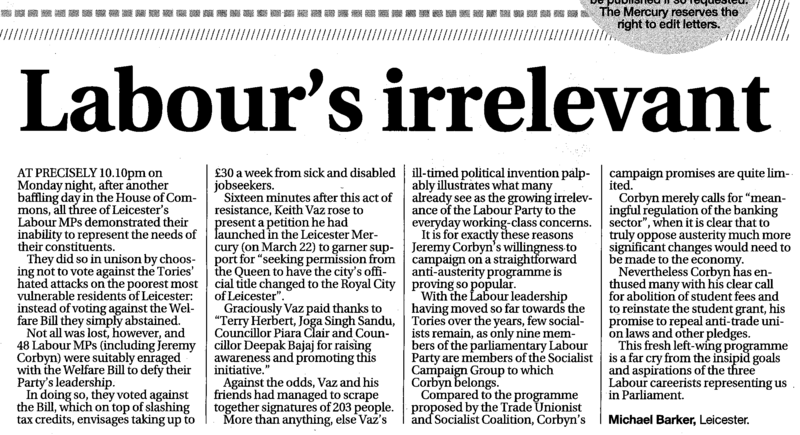 Graciously Vaz paid thanks to “Terry Herbert, Joga Singh Sandu, Councillor Piara Clair and Councillor Deepak Bajaj for raising awareness and promoting this initiative.” Against the odds, Vaz and his friends had managed to scrape together the signatures of just 203 people. 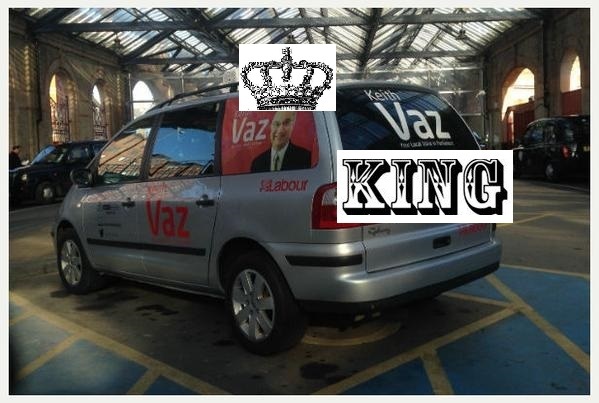 More than anything else Vaz’s ill-timed political invention palpably illustrates what many already see as the growing irrelevance of the Labour Party to the everyday working-class concerns. It is for exactly these reasons that Jeremy Corbyn’s willingness to campaign on a straight-forward anti-austerity programme is proving so popular. With the Labour leadership having moved so far towards the Tories over the years, few socialists remains, as only nine members of the parliamentary Labour Party are members of the Socialist Campaign Group to which Corybn belongs. Compared to the programme proposed by the Trade Unionist and Socialist Coalition, Corbyn’s campaign promises are quite limited. Corbyn merely calls for “meaningful regulation of the banking sector,” when it is clear that to truly oppose austerity much more significant changes would need to be made to the economy. Nevertheless Corbyn has enthused many with his clear call for abolition of student fees and to reinstate the student grant, his promise to repeal anti-trade union laws and other pledges. This fresh left-wing programme is a far cry from the insipid goals and aspirations of the three Labour careerists representing us in Parliament. Next Kendall’s “Of the People, for the People, by the People”?